Despite another strong effort from the Arkansas defense, a late turnover ended the Arkansas fourth-quarter comeback attempt as Devwah Whaley watched his Arkansas teammates fall 24-17 to Texas A&M at AT&T Stadium in Dallas. As predicted the Arkansas' leading rusher did play after taking a big hit during the Razorbacks' game against Auburn. 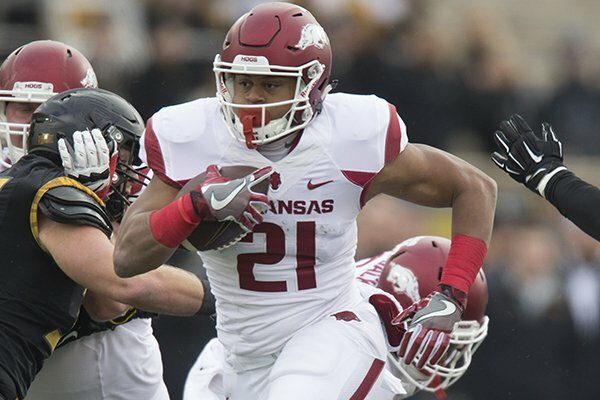 Whaley who was suffering from concussion condition was "very doubtful" to play in the Southwest Classic, Arkansas coach Chad Morris said Wednesday. Asked whether the junior running back was in concussion protocol, Morris did not confirm or deny, stating only that he would be able to talk more about the injury later in the week. Whaley was injured during the third quarter of the Razorbacks' 34-3 loss to the Tigers. He was hit almost immediately after taking a pitch from quarterback Ty Storey, and slammed to the ground by Auburn cornerback Jamel Dean. Whaley has rushed for 205 yards on 45 carries this season, and has scored two touchdowns. No other Arkansas back has more than 91 rushing yards.